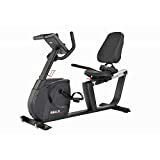 DKN have a great reputation for making high-quality, top-performing fitness products and the RB-4i recumbent exercise bike is no different. Cycling on this bike is very smooth, quiet and enjoyable thanks to the heavy 11kg (24lbs) flywheel and the multi-adjustable, extra-wide seat. This seat, along with the wide pedals and the angle-adjustable console, ensures all users will be able to ride in the most comfortable position and get the most out of every session on the bike. Try one of the 12 pre-set workouts which come in beginner, intermediate and advanced levels and find the right amount of resistance from the 32 levels of magnetic resistance which at the top end are really hard work, even for those in great shape, and mean that as you get fitter you can continue using the bike so you won’t outgrow it. You can also do the watt and manual programmes or perform a target heart rate one (chest strap needed – sold separately). The LCD display is 5″ (12.7cm), two colour and backlit, and will show distance, calories, speed, time, watts and pulse. Save your age, gender, height and weight in one of the 4 user profiles and you’ll get precise calories burnt info. Connect your smartphone or tablet via the built-in Bluetooth receiver to access some great apps that offer loads more user profiles and workout programmes, and other motivating features. The bike is really well designed with a low step-through and strong handles fixed on both sides of the console, helping people with reduced mobility use it with confidence. The black and silver styling looks fantastic and ensures it will fit in perfectly in all homes. Not only does it look great but it is also very strong and robust, made to stand up to being used by all the family. It also has a warranty covering on-site parts and labour for manufacturing defects for 2 years. JLL RE100 Recumbent Home Exercise Bike. 5kg two way flywheel with 8 levels of magnetic resistance. 6 - Levels of seat adjustment, Monitor displays speed, distance, time, calories and pulse. 12- months warranty.